How to Use Ginger for Hair Loss and Re-Growth? Natural products are loaded with vitamins, minerals and other nutrients, which make them very beneficial for your body, skin and hair. This is the reason why we all prefer natural products when it comes to taking care of our health. Ginger is one among them. The benefits of ginger are so large that the list will go on and on. It is used in many of the dishes that we make. One thing that may surprise you about this spice is that it is not only good for your health, but it is very beneficial for your hair too. Ginger has been used for centuries for the growth and health of hair. Ayurveda recommends use of ginger for hair growth. Fresh ginger roots are rich sources of magnesium, phosphorous, vitamins and potassium. These help in making your hair grow well. These elements give you a healthy and strong hair with a natural shine. Ginger root is a good remedy for treating hair loss because it helps in making the hair follicles strong. This in turn prevents hair fall and allows hair to grow long and thick. One of the most common hair problem faced by women is the dandruff. It affects the scalp and leads o hair fall. Ginger can help you get rid of dandruff. Mix ginger oil and olive oil and apply this mixture on your scalp and hair. Leave it overnight and wash off the next morning with a mild shampoo. With regular use you can get rid of dandruff and have a healthy hair. Some of the constituents in ginger are very effective for fighting dry hair. So, ginger can make your hair and scalp healthy and hydrated, providing you strong and beautiful hair that grows well. Ginger can also increase the circulation of blood in the scalp and thus allow the hair follicles to get more nutrients. This is because of some circulatory agents present in ginger. This improves the growth of hair follicles and provides you healthy hair. When the hair follicles are increased, they increase the rate at which your hair grows. Ginger is also a good source of fatty acids. This is beneficial for preventing thinning of hair. So, you can say that it helps in reducing loss of hair. These are a few of the best qualities of ginger which helps in making your hair grow in a natural way. People often get confused between ginger roots and ginger powder. 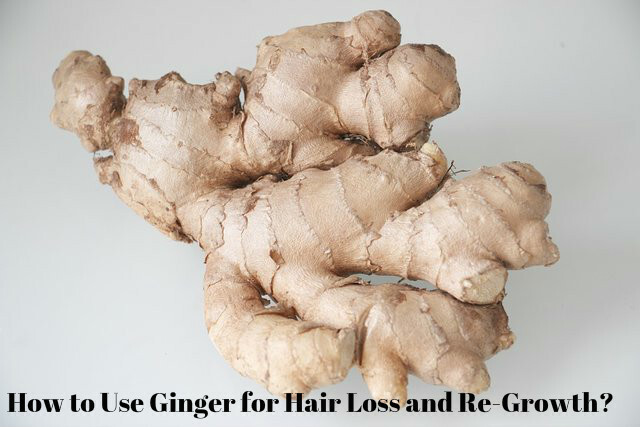 It is better to use ginger roots instead of ginger powder because the nutrients and other elements essential for the hair follicles are present more in fresh ginger roots. Other ginger products may contain coloring agents also, which may make your hair blonde. Using ginger in the correct way will make your hair grow well. It makes hair roots strong and also darken the roots. You can get rid of dandruff and prevent thinning of hair by using ginger. Grate ginger root and take 1 tablespoon of the grated ginger in to a small bowl. Add 1 tablespoon of jojoba oil or olive oil to the grated ginger. Mix them well and then apply this mixture on your scalp. Massage your scalp with your finger tips in circular motion. Keep massaging for about 5 minutes. Let it remain on your scalp for at least 30 minutes. After a while, you will start feeling the warmth. Wash your hair with a mild shampoo. Do not use a conditioner immediately after washing your hair. You must remember not to let this mixture dry when you apply it on your hair. Also do not keep it for long hours on your hair. You can treat your hair this way with ginger once or twice a week for getting the best results. Here is another way to use ginger on your hair. Take 6 ounces of fresh ginger and peel off the skin. Now take 1/4th cup of water and put the ginger pieces and the water in a blender. Blend them well till the ginger turns into a fine pulp. After blending them, take a small bowl and line it with three layers of cheesecloth. Now pour the mixture of water and ginger on the cheesecloth. Gather all the edges of the cheesecloth so that it takes the shape of the bag. Squeeze, twist and turn it as much as possible, so that the juice of the mixture comes out of the cheesecloth and gets collected in the bowl. Apply this juice on your scalp and wait for 5 to10 minutes. Wash it off with your favorite shampoo. Take a few pieces of fresh ginger and grate it. Add three tablespoons of sesame oil and a few drops of fresh lemon juice to the grated ginger. Apply this on your scalp well and then massage your scalp gently with your finger tips. Let this mixture remain on your scalp for about 30 minutes. Wash it off well with a mild shampoo. If you have more of the mixture, keep it in the refrigerator to use it afterwards. If you have a sensitive scalp, you may feel irritation or a strong tingling sensation on the scalp when you use ginger. You need not worry. You can still get the benefits of ginger by reducing the quantity of ginger and the time you leave it on your scalp. Using ginger regularly on your hair provides you healthy and beautiful hair within a few months. It is natural and very safe for your hair. Moreover, it does not cause any side effects. Wow!! Awesome recipes. Thanks for sharing these recipes. mere scalp k front se dono bagal side k hair bahut hi kam hai jinki wajah se mai apne balo ko kbhi v pony look nhi rakh pati …. plzz suggest me.. Apply Onion juice on your bald area trice in a week. its take two or three months to grow your hair. Mere baal kabhi nai badhate I try this, sure na badh jaayenge.? Thanks for the write-up. A quick one, why do you suggest living the mixtures for less than 10mins max? Any particular important reason(s)? can i apply this mixture over night on my hair?? ?